Elegant in style, French doors are popular amongst homeowners who wish to enhance the aesthetics of their property. Adding a touch of class to both modern and period homes, these doors are classically beautiful – attracting visitors and potential buyers alike. Add value to your home with uPVC French doors. Their intrinsic glass panels will allow for plenty of natural light, helping your property to appear bigger and brighter. 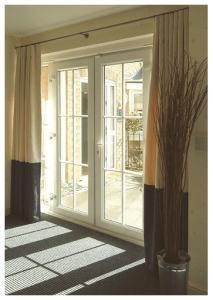 Here at Secure Style, our French doors are available in a wide range of styles and designs. Available in both low and standard thresholds, our doors come with a choice of panels and glass styles. Whatever your preference, you are sure to find a French door to complement your home from our fantastic collection, with doors to suit your individuality and style. Secure Style offer a free non obligation quote service for our uPVC French Doors. Obtaining your free quote is quick and easy. Simply visit our online quote section, complete the short form and send. You’ll receive your unique quote instantly.